The shipping rates and delivery schedules are subject to change without notice. You are responsible for any brokerage fees, duties, taxes, etc. imposed by your country upon receipt of your package. You pay us for the product and shipping. We do not monitor, collect or pay the taxes and fees of other countries. Products that have shopping carts include shipping calculators starting with the "add to cart" button. To calculate shipping go to the page that has your product, hit the "add to cart" button, enter your quantity, country and postal code, and hit the "update cart" button. Select your shipping preference from the drop down menu and hit "update cart" again if you change your shipping preference. We do not have access to information about the taxes and fees you will pay at delivery. Please contact UPS or Customs in your country to find the tax and fee policy in your country. We ship using UPS International shipping which is fast, tracked and insured. Contact us with your items, quantities and delivery address for a UPS shipping quote. UPS cannot ship to PO Box addresses. A physical address is required. We do not undervalue packages to avoid taxes and fees. Please do not ask us undervalue packages for customs. UPS orders typically ship the same day if the order is received by 3:00PM EST. The shipment time applies to products in stock. Special orders and back orders do not ship until we receive the product. UPS Standard is not available to Mexico through the shopping cart. Brokerage charges to Mexico for UPS shipments are handled by UPS. If a customer in Mexico refuses to pay these charges UPS returns the package to us and charges us for the return shipping. If you are in Mexico and want to receive your package by UPS Standard shippping and understand and agree that in addtion to any taxes and fees imposed in Mexico that UPS brokerage fees will apply and you agree to pay them at delivery you can call us with your order. In Canada there are usually three types of fees. These are duties, taxes and brokerage fees. Fedex and UPS both offer what they call Standard shipping which is similar to domestic Ground shipping. Standard and Air shipping are subject to brokerage fees. Duties are usually a small amount of money and if the product is made in North America we fill out the NAFTA paperwork to prevent you from paying duties. Tax rates, as we understand it, vary by province. We do not track the tax rates in Canada. Brokerage fees are a little more expensive and complex. If your product value is under $20.00CA there is no brokerage fee. We have a special arrangement with UPS to provide a discounted brokerage fee of $10.00CA when the value is between $20.00CA and $200.00CA and delivered to a residential address. You can find import fee information at ups.ca. 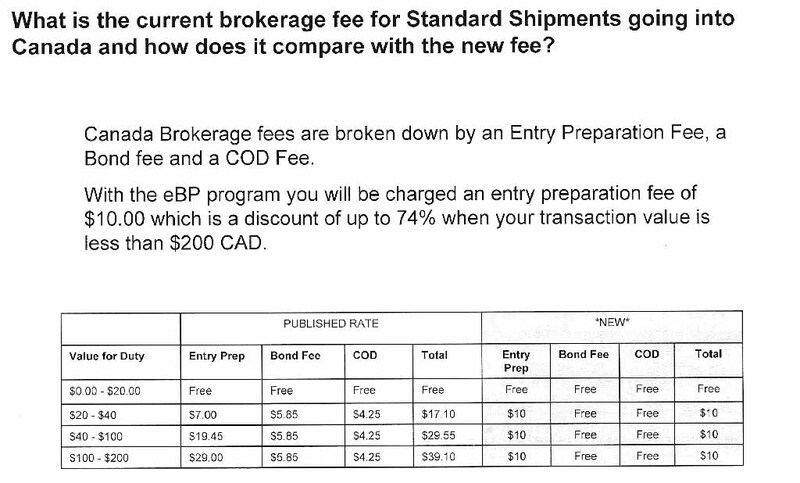 Below is a scan of the brokerage fee program that shows the discounted brokerage rates you can expect to pay when you are ordering from us and having delivered to a residential address.